Plan on wearing a super chic Birdcage Veil for your wedding day? Having a hard time finding one in your price range, or one that you feel is “you”? 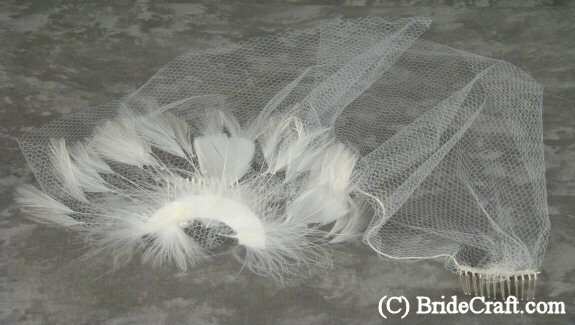 Want to know How to Make a Birdcage Veil just like this one? Then you're in the right place! Below you will find a step by step tutorial showing you how to do just that. Pros: Pretty easy and inexpensive to do. Of course this can be made in advance, and can be customized in any way your heart desires! Cons: This project can be a bit tricky, and might frustrate the impatient crafter. 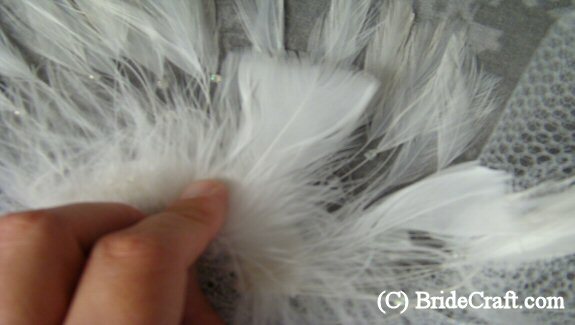 Step 1: You will need at least two feet of stiff tulle/netting, a feathered embellishment and extra feathers (These are optional, and certainly interchangeable with other decorative bits! ), a glue gun and glue stick, two small metal hair combs, scissors and needle and fishing like or fine thread. Note: A wide thread was used solely for photographic purposes. 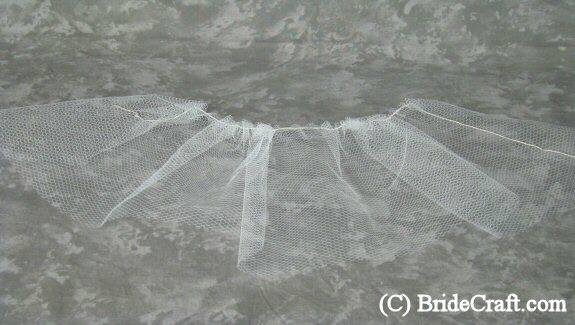 Clear, thin fishing line or a matching thread will give this veil a more professional look. Step 2: Measure the tulle against your head to get a feel for the length and width that you would like. 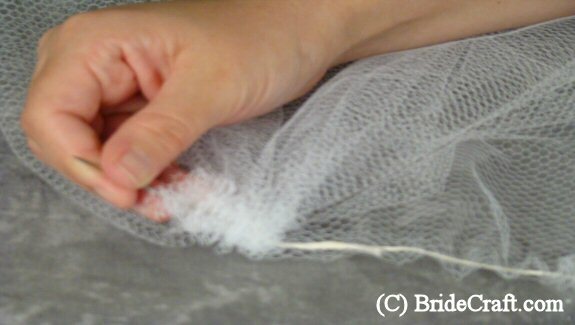 Then trim the netting , adding at least three inches to the length of the cut. You should have a rectangular strip of tulle. 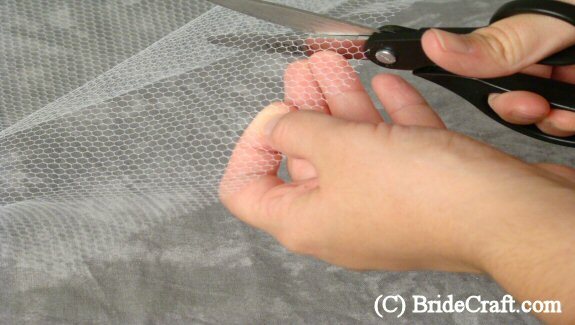 Tip: Play with the shape of the netting! Hold it to your face and decide if you would like a scalloped, curved or straight edge. 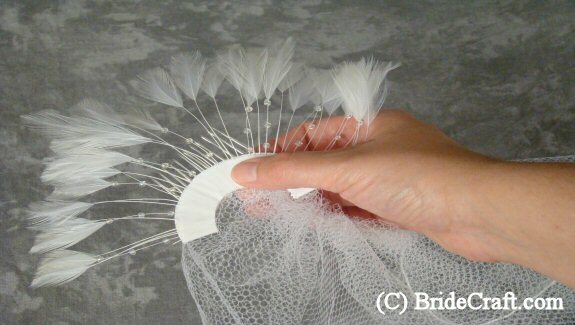 Step 3: Pull your needle and thread through the top of your strip of tulle, and gather gently to create a slight fan shape in the veil. Step 5: This step is optional. 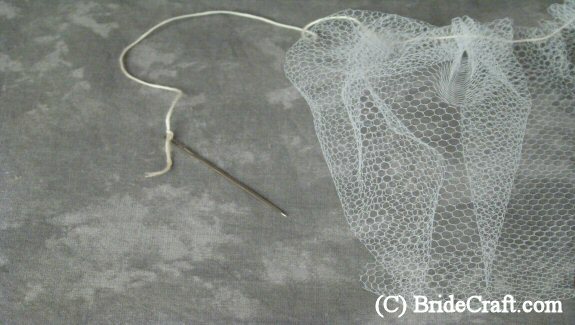 Holding the thread and needle securely, work a section of the netting towards the needle end. You should basically be creating a gathered side that will be a denser section of netting. This is the side your embellishments will be secured. 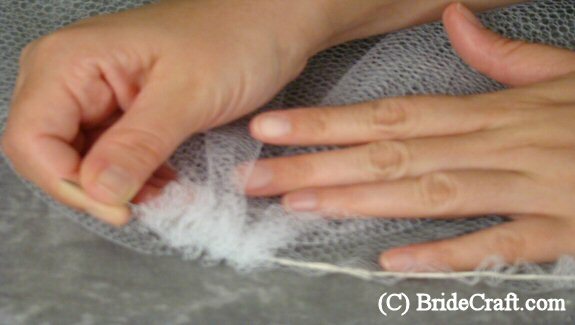 Step 6: After you’ve gathered the amount of netting you would like, secure it with a knot directly behind where you would like the effect to end. 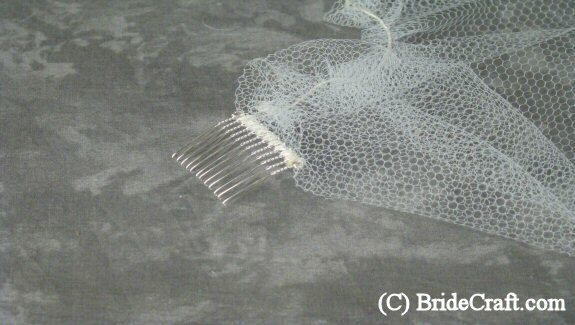 Step 7: Sew a small metal hair comb to each “upper corner” of the veil. 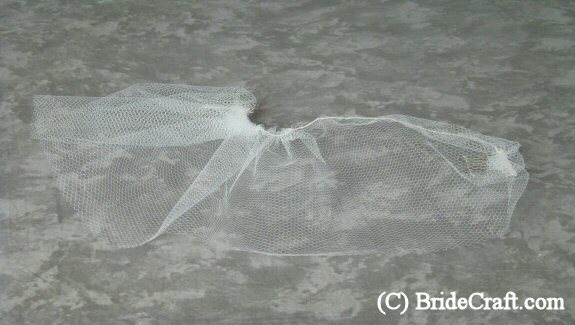 Step 8: Your veil should look like this now. Note that the gathered end is curling up. Step 9: Another view, showing you how the netting and combs should be able to wrap in a U shape. 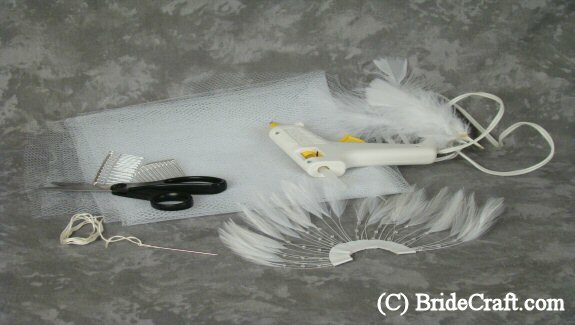 Step 10: Take your main feather embellishment and hot glue it to the gathered corner of netting, securing to the comb. Tip: Use a light hand with the glue, until you can decide on how much you need. Step 11: Place delicate dabs of hot glue in position so that any undesirable materials can be concealed with additional feathers. 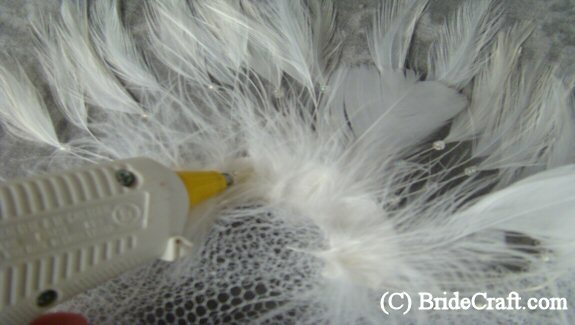 Step 12: Carefully press your feathers onto the glue. Continue until you are satisfied with the overall look of the veil. Tip: Remember not to singe your fingers! Use caution. 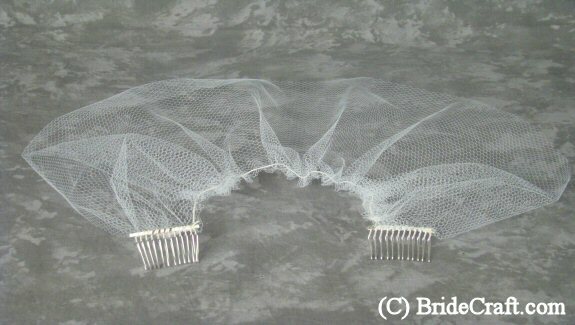 Step 13: You now have a beautiful birdcage veil, ready to wear! Remember to take your veil when going to hair trials. Store in a dry, safe place until wedding day.